Black Friday at the big box stores is a cherished tradition. Cyber Monday steals are legend. And in the spirit of entrepreneurialism, we’re supporting the first-ever Small Business Saturday, featuring 8 women-owned business with products you shouldn’t miss. Sure, you can do all of your ho-ho-ho-hum holiday shopping at the mall, but what she’ll really love are these eclectic beauty and fashion finds! 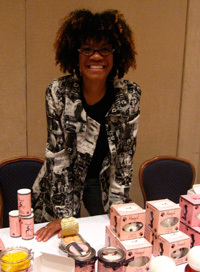 With a little encouragement from her husband, Terry Wesson started Honeycat Cosmetics in her kitchen. The Brooklyn native’s sensual bath and beauty line celebrates every woman’s inner cat woman with fun and fragrant homemade products ($4 – $50) like “Frisky Kitty Bath Fizzies. Created by humanitarian and licensed aesthetician Stacy Fader, Kumani Essentials is a luxury line of hair, face, and body products made with natural Shea Butter from West Africa. When you purchase the products ($24 – $48), you’re not only soothing your skin, you’re also helping the African women of Burkina Faso working in the Shea Butter cooperative to earn a fair wage. Inspired by founder Roberta Modena’s affection for all things eco-friendly, World of Green is a one-stop web shop featuring beauty and fashion items that reduce waste, reuse materials, use certified organic ingredients, and employ fair trade practices. World of Green’s holiday gift guide offers stylish, socially-conscious items like Naturally Knotty’s bamboo cotton wrap ($39.99). 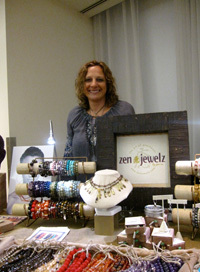 Fans of “The Real Housewives of New Jersey” are already familiar with Zen Jewelz by Jennifer Mirman. Known as Zen Jen, she crafts handmade jewelry made with top quality, healing gemstones that bring the wearer good luck, wisdom, health, and creativity. Each customized piece ($55 and up) is cleansed and energetically charged. From Now Until Eternity (F.N.U.E.) is what every girl wants to find under the Christmas tree. Halley Barney’s jewelry ($65 and up) is a token of true love handcrafted from sterling silver, 14-karat gold, 18-karat vermeil, and precious gemstones. Each whimsical piece exudes elegance, distinction, and luxury. Jessica Ricci transforms religious artifacts, lace patterns, and keys from bazaars and markets around the world into fine jewelry. The former journalist’s collection ($90 and up) is rustic yet refined and embodies her love for travel and culture. Thanks to SnugglePie, your baby can feel as warm and cozy in his or her stroller as you do in your U.G.G.’s. Created by creative New York City Moms Karolin Falk and Dana Moyal Kolevzon, this new line of luxurious stroller sacks ($350) is made of natural, dry, and durable New Zealand shearling and lambs wool. College buddies Ashley Connors and Hannah Lavon recently launched Hoopla, a kitschy product development and gift company specializing in vintage-inspired greeting cards, humorous mugs, and handmade animal mittens fashioned from strictly-regulated farmed Australian wool ($27.99). With today’s economy everyone is looking for things that are affordable and practical. Shay looks at 4 gifts that are not only practical but still have that special touch. Perfect! Do pets make good gifts for the holidays?